David Cush, CEO of Virgin America, reached out to a member of his IT staff in the audience while he fumbled for a Salesforce product name during a customer panel. Soon, other panelists reached out to their “lifelines” for similar help. To me that was an apt reminder that while Salesforce ties them into neat bundles – Sales Cloud, Service Cloud etc, the company’s product line has grown by leaps and bounds with its acquisitions and partnering. Marc Benioff ‘s interviews with Sir Richard Branson, then Jeff Immelt of GE and Gen. Colin Powell covered a wide range of topics from leadership to energy policy to nuclear proliferation and “de-criminalizing of drugs”. Policy talk unusual for a technology conference. Beth Comstock of GE and Scott Monty of Ford, marketing executives for two of the best known brands in the world and Buddy Valastro, celebrity cake chef vividly brought out how IT is helping top lines in enterprises after decades of back office focus. It confirms the pivot point the industry finds itself at. A lady from Accenture kindly pointed out Salesforce had subtly changed its tagline of “Social Enterprise” to “Business is Social”. Need to be careful to not mix social, charitable causes with that of making money. The money dimension was clearly in the air in the partner show floor. Most are still focused on Siebel to CRM conversions or email marketing – circa 2007 – but if calling it Social makes more money, why not? 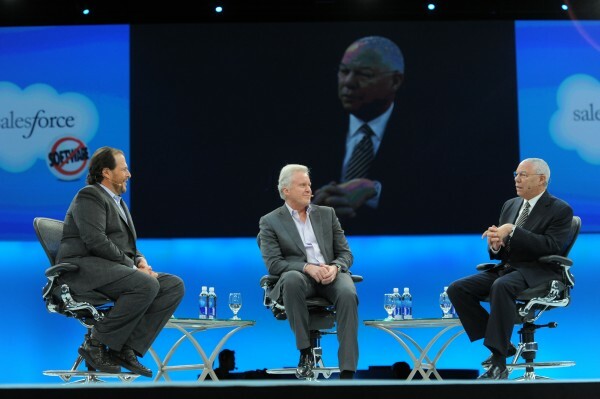 Dreamforce to me was nested layers of reality and illusion, kind of like the Dream that is the movie “Inception’”. As I listened to my MP3 on the BART train to the airport, Manfred Mann belted out “Revved up like a Deuce”, and the movie ending with the spinning top came to mind. Cannot wait to see the sequel where Marc’s spinning top goes next.